The “underground” nature of raw milk intrigued me. I had heard and read about the benefits of unpasteurized milk and the way heat can destroy enzymes and vitamins and subtly change the proteins. Through the Weston A. Price Foundation, I found someone who could connect me with a cow share program that made deliveries into Fairfax. She even gave me a taste or raw milk. I was hooked. The texture and sweetness were amazing. I’d been working on overcoming my fear of eating fats, having grown up during the years of low-fat and no-fat propaganda. I can’t recall our family ever drinking anything but skim milk, the kind that—this should have been a clue—helped fatten hogs. During and after college, I lived in Russia and my Russian friends surely thought I was insane, for there they slathered their brown khleb with butter—a quarter-inch thick, I swear—and eating slabs of salo (hog fat) as well. And they seemed perfectly healthy and were not fat themselves. Maybe eating fat in moderation wasn't too bad. So, convinced that drinking whole fat milk could be a good thing, I researched the farm and contacted the share coordinator. 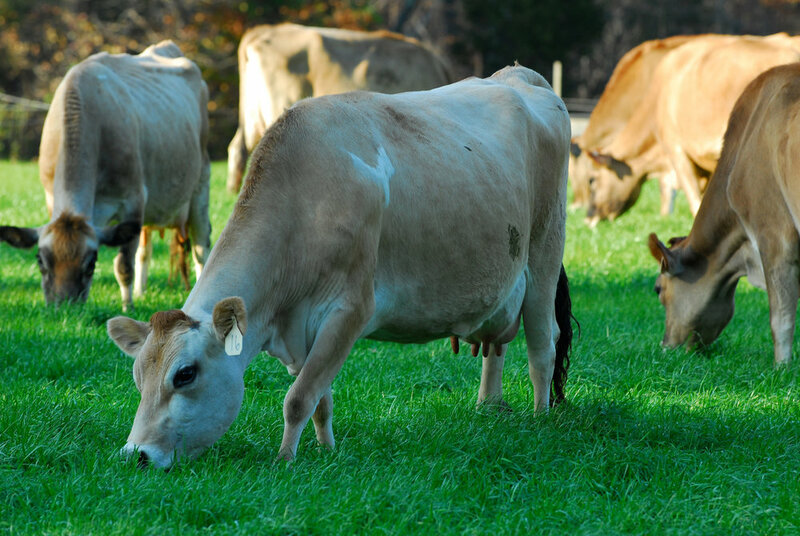 The share program then had four Jersey cows—the breed with the highest butterfat content. I bought a share. On delivery days, I’d set out a cooler with lots of ice packs and go home during lunch to bring in the milk. It came in gallon-sized jars, with thick cream, usually at least two to three inches from the top to the cream line. Soon, I was making my own butter. I’d ladle off the cream—I could never get all of it, so there was always some left in the milk—and place it in quart-sized Mason jars in the fridge. Before leaving for work in the morning, I’d set the cream on the counter to let it stand. After work, I’d pour the contents into a blender and run it low first, then increase it gradually to high speed. Depending on the season and the density of the cream, I’d have butter in about 10 minutes. I’d smear that butter on anything that would take it. Sometimes, I’d leave out a small amount of milk and cream to make a kind of farmer’s cheese, somewhat like cottage cheese, but with not as many curds. In time, I bought cultures for kefir and viili yogurt and made those too. Best of all was to come home from work and have a glass of milk and a piece of dark chocolate before supper and evening classes. Despite all the controversy around unpasteurized milk and the emotions it stirs, being able to enjoy it and make things with it is an experience I wish everyone could have, because I appreciate how much it taught me about the interconnections between soil, animals, and humans and about my own role in helping to restore some of those broken linkages. If you’re going to explore a share program in Virginia—and even if you are in Maryland and getting local milk—there are certain things to look for. Not everyone who wants milk can visit the farm where their dairy comes from, but I’d encourage such visits, because it helps you learn what’s beneficial or detrimental. What’s your first impression of the farm? Would you want to drink milk from there? Same questions with the people—how attentive and caring are they? Do you sense, despite all the ups and downs in their average day, that they really love what they do and love the animals? Are the cows getting the bulk of their food from grazing fresh grass? (Note that even in grass-based systems, cows often receive some grain at milking time.) How regularly are they moved? (Twice a day in paddocked system is optimal.) What are the pastures like? (Just as with people, cows benefit by eating some “weeds,” which provide different kinds of phytochemicals.) What do they eat in winter? What’s the process around milking? How quickly do they chill the milk? What happens when a cow gets sick? Is it sequestered from the herd and milked separately? What do they use to treat it? Ask to see the records. In Virginia, share programs are not required to be inspected, but farmers should still regularly sample the milk and check for somatic cell counts, which indicates the quality of the milk, based on the presence of bacteria and potentially, mastitis. Bacterial counts highlight the cleanliness of the equipment or the presence of non-cow bacteria, such as that transmitted by hands. States may have different acceptable ranges for these counts, but uninfected cows should have SCCs below 200,000 cells per milliliter. Bacterial counts should be below 1,000,000 bacteria per milliliter. The Raw Milk Institute (RAWMI) offers additional standards as well as guidance for raw-milk farmers on developing Risk Analysis Management Plans. Visit www.rawmilkinstitute.org for more info. And, for more information on cow-share programs, visit www.realmilk.com. Leigh Glenn is a contributor to Edible DC and is a freelance writer and editor based in Annapolis, MD. She writes about farming, food, permaculture, gardening, herbalism and enjoys cooking—and hooking, with wool to create fiber paintings. What’s Up with A2 Milk?